BRAQCON 2019 will provide a unique platform for people involved in brackishwater aquaculture and fisheries, nationally and internationally. Sharing of experience and research advancements in the frontier areas would facilitate maximum utilisation, cultivation, conservation and development of aquatic resources. The conference would elicit interest among young researchers and scientists to undetake studies and research to further open up new blue growth avenues for a better world. 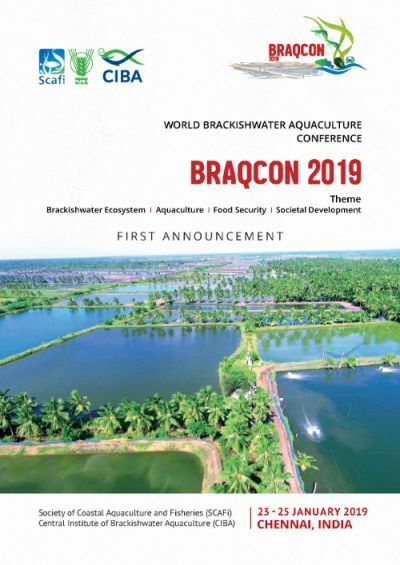 BRAQCON 2019 is also an attempt to foster cooperation between concerned governmental, non-governmental institutions, private sector and farmers for advancement of sustainable aquaculture and fisheries in brackishwater ecosystems. Brackishwater and estuarine biodiversity and conservation. Aquatic environment and climate change. Socio-economic and livelihood issues of fisheries and aquaculture. Side events will include the Farmers Conclave 2019 where industry participants can share their views with policy makers and researchers and an 'Aquaculture start-up meeting', aimed at entrepreneurs planning to enter the industry and allied sectors wishing to present ideas, innovations and technologies. For more information please visit the BRAQCON 2019 website or download the First Announcement below.